Noah was normally a fun and high-energy child. But last summer when his mom, Sandy, noticed he had slowed down a bit, she thought he might be grieving the recent passing of his grandfather. When Noah’s energy still hadn’t returned and he spiked a fever later in the summer, she took him to the pediatrician. After getting some test results, the doctor urged her to take Noah to go the emergency room at nearby Texas Children’s Hospital West Campus, where he was admitted right away. A bone marrow test revealed that Noah had leukemia. He was transferred to Texas Children’s Main Campus in the Texas Medical Center on the eve of the Fourth of July. “That whole time was a blur,” explains Sandy. “We were trying to figure out how to deal with Noah’s diagnosis. 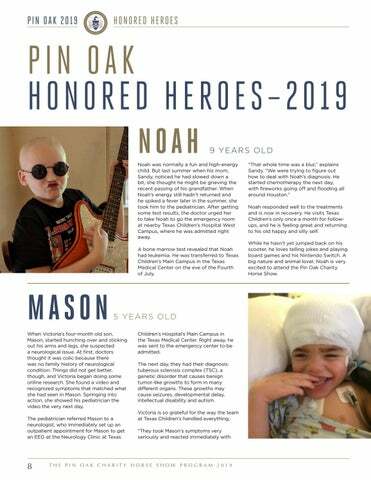 He started chemotherapy the next day, with fireworks going off and flooding all around Houston.” Noah responded well to the treatments and is now in recovery. He visits Texas Children’s only once a month for followups, and he is feeling great and returning to his old happy and silly self. While he hasn’t yet jumped back on his scooter, he loves telling jokes and playing board games and his Nintendo Switch. A big nature and animal lover, Noah is very excited to attend the Pin Oak Charity Horse Show.